With Summer on temporary hold, the barbeques are taking a rest and the old dilemma of what to eat surfaces. For me this is the ideal weather for a good foie gras, accompanied with a chilled bottle of ” sweet wine “. Wines taste sweet mainly because of the amount of residual sugar they contain (although the impact of this on the palate is greatly influenced by factors such as acidity, and serving temperature). So long as there is sufficient acidity to balance the sweetness, a sweet wine is by no means cloying. Basically, many sweet wines are made by simply leaving the grapes on the vine for as long as possible in order to concentrate the grape sugars. If *noble rot fails to materialise, the grapes simply start to raisin or shrivel, described as moelleux in French. These wines can be extremely rich and satisfying, but are less complex and less long-lived than those made from grapes transformed by the action of ‘noble rot’, generally referred to in France as liquoreux wines. My coup de coeur of my ” sweet wines ” is Chateau La Tour Blanche, ranked in the top of its class right behind Yquem in the famous 1855 classification of Sauternes wines. Having spent a full year of my life studying oenology and viticulture at La Tour Blanche, this will always have a special place in my heart. The vintage is 1999 ( with a 1998 on the way) and I refer to Robert Parker for his very accurate description: ” Light gold with a nose of tangerines, intermixed with apricots and peach jam; with a hint of oak and acacia flower. Anticipated maturity : now – 2018. ” This stunning liquoreux wine sells at 54 euros . Saussignac – an enclave of great sweet wine making, this appellation covers 92 ha. Chateau Seignoret Les Tours ” cuvéé coup de coeur ” is produced totally from Semillon grapes which have been attacked by the noble rot. Several passages are made in the vineyard during which individual grapes are handpicked at optimum infection level. This medal winning 2001 saussignac is available in the cave at 14.90 euros, and is perfect with foie gras and a lovely roquefort cheese, or even just as an aperitif well chilled. Rosette – probably the least known appellation of the Bergerac region producing a limited amount of sweet white wines – 525 hl on a total of 19 ha. Domaine du Grand Jaure is sold at 7.50 euros. A gold medal winner in Paris, this 2005 moelleux was harvested at perfect maturity. With delightful aromas of citrus fruits and green apples; it is an elegant wine with perfect balance between fruit and acidity. At 11.5% vol it is the ideal aperitif . 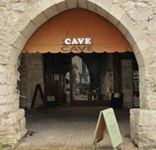 The Cave also has two excellent Monbazillacs – La Truffière produced by Fabrice Feytout at 8.90 euros a bottle and L’Ancienne Cure by Christian Roche at 9.50 euros a bottle. You are more than welcome to taste these at any time. There is also a Jurancon – Chateau Jolys at 8.90 € and a Coteaux du Layon at 7.90€. Plus a Bergerac moelleux from Chateau Plaguettes at 6.90€ and last but not least a 5 litre BIB moelleux from Duras at 12.50€ for the 5 litres. * Noble Rot is the benevolent form of Botrytis Bunch Rot in which the Botrytis cinerea fungus attacks ripe, undamaged white wine grapes, and given the right conditions is capable of producing probably the world’s finest; and longest living sweet wines.